H.E. 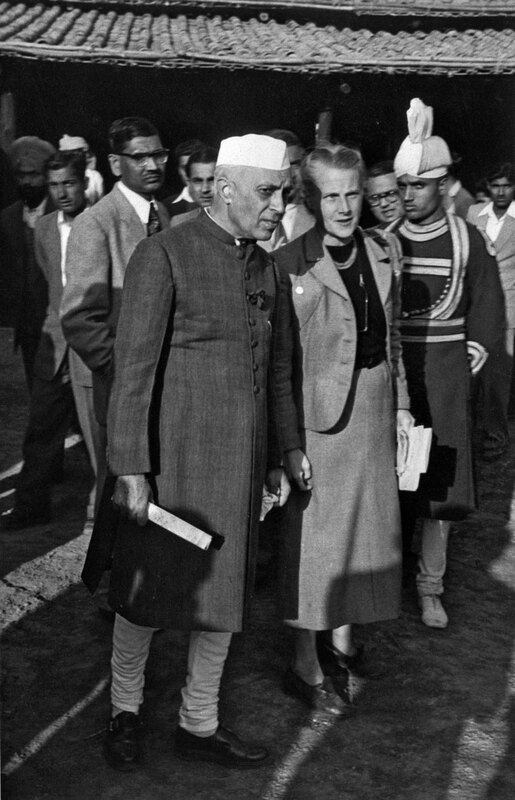 Mr. Jawaharlal Nehru, Prime Minister of India as he visited the "model village", with U.N. technical assistance expert, Miss Jaqueline Tyrwhitt, who directed the Seminar, 1954, New Dehli, India. A United Nations Regional Seminar on Housing and Community Improvement opened in New Delhi on 21 January and ended on 17 February 1954. In conjunction with the Seminar, the Indian Government organized an International Exhibition on Low-cost Housing, one of the major features of which was a "model village", properly planned for community life, in which none of the houses cost more than 5,000 rupees - the equivalent of a little more than 1,000 dollars. Included in the "village" was a replica of the hut in which Gandhi lived and worked. Courtesy of the United Nations. At the center of a vast series of major modern architectural innovations was a woman largely unacknowledged, whose work has contributed to reshaping the ways we think the world. Jaqueline Tyrwhitt is the focus of two symposia from 2014 to 2015, in London and the United States, which trace innovative trajectories that linked modern architecture and urbanism to new technologies of vision and integrated spatial planning, international cooperations, and concepts of cohabitation around the entire planet. Tyrwhitt's work is for the major part invisible: at the side of Sigfried Giedion in his American works, behind the scenes of the CIAM conferences, and next to Constantinos Doxiadis at the Delos Symposium and debates over Ekistics research. She organized, structured, built up, and constantly innovated new approaches to thinking the ideals of the modern city. The symposia outline her work in connection to current discourses on contemporary architecture, urbanism, and planning on a global scale. John Palmesino and Ann-Sofi Rönnskog are the directors of AA Think Tank, a newly established research center at the Architectural Association (AA) in London. As architects and urbanists, they are the founders of Territorial Agency, an independent organization that promotes and works for sustainable territorial transformations. They are coauthors of the Anthropocene Observatory, a project which traces the development of a new geological epoch shaped by mankind. Their work focuses on the transformations of the relationship between polities and space. Their projects include The Coast of Europe, multi-year research on the urbanization processes of the European project; and North, an investigation in contemporary forms of geopolitics, sovereignty, and resources exploitation in the Arctic. For their doctoral degrees, Palmesino is researching the spatial consequences of neutrality and Rönnskog is investigating remote sensing and territorial change in the North. They teach at the AA. Keller Easterling is an architect, writer, and professor at Yale University. Her books include Enduring Innocence: Global Architecture and its Political Masquerades (MIT, 2005) and Organization Space: Landscapes, Highways and Houses in America (MIT, 1999). Her latest book Extrastatecraft: The Power of Infrastructure Space (Verso, 2014) examines global infrastructure networks as a medium of polity. Founded in 1847, the Architectural Association is Britain's only remaining private architecture school. It has evolved alongside modern architecture. Over the past decades AA graduates have been regular winners of the world's highest professional awards, and in the past decade, three AA graduates have received the Pritzker Prize. 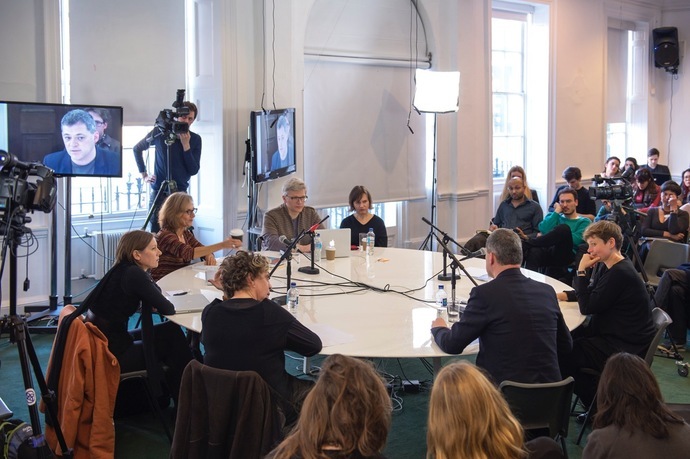 An essential part of the AA is its public program, the world's longest dedicated series of events on architecture and urbanism available, free, to a public audience.